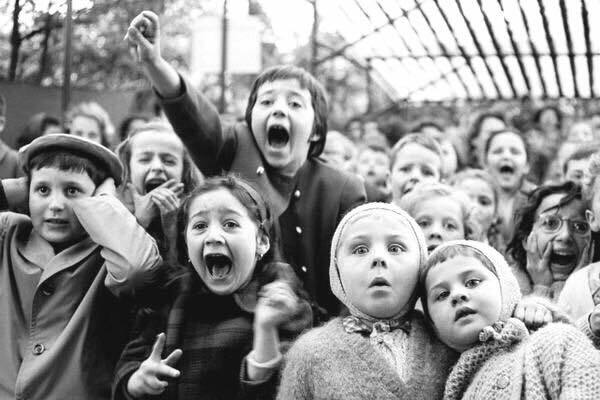 I’m captivated by this picture from 1963 of Parisian children watching a puppet show. I think it’s mainly because the level of interest in their eyes is so intense. They just can’t pull themselves away from whatever is happening on stage. The kids clearly weren’t ready for that little development in the plot! We talk a lot about how to build engagement in learning and the means by which strategies that promote positive feelings like humour, inspiration and drama can promote higher levels of engagement. Equally, we talk a fair bit about those strategies that promote negative feelings like boredom and confusion as being unhelpful engagers. But something we forget is that the research on human affect lists many positive and negative feelings and ranges, but only one that is neutral. Neither positive or negative is the feeling of startle. Designed to draw our full attention away from what was previously occupying our minds, it’s the sound of a clap of thunder, the backfiring of a car or the bursting of a balloon. It does us neither harm nor good – but, boy, does it get our attention! Often in workshops, the afternoon fog of having eaten too many party pies can envelope the audience. And so, I often tell a brief story of me losing a little linguistic control as a School Principal. In an instant, any snoozing participants are jolted back to reality by my booming voice pretending to roar at a room of recalcitrant students. The story isn’t always relevant, it’s more purposeful. Nobody is particularly harmed or helped by the shouting. But what I do know for certain is that they are listening to the next part of the presentation. Just very occasionally, be startling.